What does it mean to be "deep stacked?" And once you get a stack that qualifies as "deep," what do you do with it? Fear not, for we are going to sail into this uncharted territory and help you find your way. Firstly, let's look at the meaning of "deep stacked." In No Limit Hold'em cash games you are classed as being deep stacked when the pile of chips in front of you is significantly greater than the value of 100 big blinds. Congratulations, you get a badge. Well, no you don't really. What you do get is some interesting strategy choices at that point. So let's look at how we need to adapt our poker style when playing deep. As your stack turns into a beanstalk and starts to grow, you need more than a cow and a few magic beans to risk it in an all-in showdown. Generally, hands such as top pair with an ace kicker are rarely good enough when stacking off for 300 big blinds. That means that hands like AK offsuit or AQ offsuit drop in value, while hands such as 89 suited gain in value. You might look down and a Big Slick and shove with a short stack, but you shouldn't be jeopardising all of your money with a weak hand. Be patient, and get your money in good. Once you have some weight on the felt, you can throw it around a little. But pay attention to position. When you have the advantage of position and a deep stack, you want to 3-bet a very wide range of hands. Even if your opponent is holding AK or QQ, they will not be overly enthusiastic about stacking up against you when they are also deep. If you 3-bet a wide range of prospective hands in position, even when our opponent does call, you will find yourself in very good shape. When there is a fish feeding frenzy going on, you can widen your range of 3-bet hands considerably. Any suited paint will make a fine 3-bet in position. Although do check just how much the fish are biting and bear in mind the depth of your stack. You might even start including mid suited connectors and suited aces if the fishing is good. When you are out of position, life is less rosy. Generally, you want to 3-bet bluff much less when you opponents are adapting to the deeper stack sizes. The deeper the stacks, the narrower your stacking range gets - and that makes you more vulnerable to 4-bet bluffs. In addition, you are also going to see your opponent’s flatting ranges widen significantly, and hence see your fold equity reduced. However the above assumes your opponents will adapt correctly. If they don't, then carry on as normal and replace any KT offsuit hands with their prospective 78 suited equivalents. The use of this tactic very much depends on your opponents. However, as a general rule the deeper the stacks are, the stronger the hand we need to stack off pre-flop. At 150 big blinds and above reconsider shoving with AK or QQ. And, if someone 3-bets you from the blinds when you hold one of these hands, you may be best flatting them. Also, if someone open raises from under the gun while you hold that hand, flat calling might still be your best option. When you get to 200 big blinds and above, even the mighty KK is no longer a fist-pump, and you may want to take the same precautions before screaming "all-in." Stack size is not the only factor to consider though. Take a good look at your opponent, your position, the meta-game and prior actions. 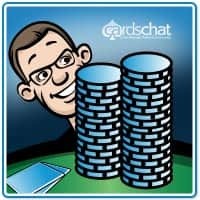 In general, when you are holding a premium hand that isn’t AA, think carefully about whether you would be comfortable stacking off before you 3-bet or 4-bet. The deeper the stacks the more important position is. You'll want to tighten up UTG and open more hands from the button. We can flat more in position, and should flat less out of position. When we have a draw to the nuts, we want to play it very aggressively. We can play aggressively with considerably less outs than we normally would as our implied odds, and fold equity, will be better in a deep pot. 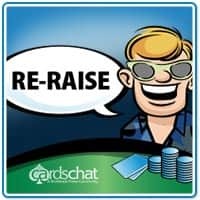 The reverse applies when our outs are tainted; As2s on a KcKsQs board is not something we want to 3-bet the flop with, when a lot of the hands that stack off for 300 big blinds will have us drawing dead. Think about how uncomfortable you would feel in the villain's shoes when you are raised out of position playing for three buyins. Threaten your opponent’s entire stack and expect great fold equity. In position we can flat 3-bets much wider than we could when we were 100 big blinds deep. Once again, we are favouring hands like A9 suited over KQ offsuit. You can generally set mine 3-bet pots to your heart’s content when deep enough. When your opponent’s stacking range is tighter, you can expect your 4-bet bluffing to become far more profitable. You can 4-bet bluff far more often with hands that are not strong enough to flat a 3-bet. Axo/Kxo make very good candidates as they halve the likelihood of villain having AA/KK respectively. A word of warning: your stacking range has also narrowed, yet your bluffing range has increased; a strong observant opponent can, and will, exploit this. 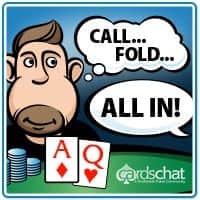 If you feel your opponent has adjusted and started 5-bet bluffing, you will need to calm down on the 4-bet bluffs and extend your value range. Whether you have 250 big blinds or not, with the right history AK can suddenly be a viable stacking option once again. It also goes without saying, don’t 4-bet bluff fish! Let's look at some examples of how deep stack strategy can be put to use. Remember, the main concern is your opponent, so it is their actions and their meta-game that are going to primarily determine what you are going to do. Example 1 - We are seated at a 6-seater table with 50c/$1 blinds. We are on the Big Blind with $250 in chips, while our main opponent - a good, aggressive player also holding $250 in chips - and they are seated on the button. The cards are dealt and we get Ace Ten off-suit (ATo). The button raises $3 and the small blind folds. What do you do? Remember, we are deep stacked and at a positional disadvantage. If we were 100 Big Blinds deep then this hand would possibly be strong enough to flat call or 3-bet. As we are 250 Big Blinds deep, then ATo becomes a weaker hand and our positional disadvantage to an aggressive player makes this a clear fold. Example 2 - Once again we are seated at a 6-seater table that is playing at 50c/$1 blinds. We are in the Cutoff position (one position to the right of the dealer). We are nicely deep stacked with $300 in chips in front of us and look down to see a suited Jack Ten as our hole cards. 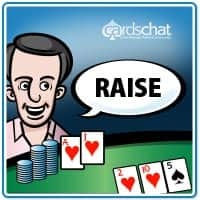 The under-the-gun player, who is a huge fish, also deep stacked, and who has been consistently raising lots of hands before the flop, raises $4. The action folds around to you. What do you do? Given our positional advantage and the fact that we are playing against an opponent that is regularly raising pre-flop - while also exhibiting poor post-flop play - we could call. Certainly, if we had 100 big blinds in chips, that would be a fair play. However, given our positional advantage, 350 big blind stack, and incredible implied odds for when our hand hits, a re-raise to $16 would be quite reasonable. Example 3 - While at another 6-seater 50c/$1 table (we like them) we are dealt an offsuit AK. We are the on the button - yay for us - and have a healthy stack of $220 in chips. We use our positional muscle and raise $2.50 and watch the action get folded around to the Big Blind. Now this player has only recently sat down at the table and we don't know much about him. The few hands we have seen him play, he has been a little taggy, winning a large pot to double his stack. Well he looks across at us and re-raises to $9, taking the chips from his deep stacked pile that matches our own. Well you could shove all-in and see what the Big Blind is holding and whether or not Lady Luck just filed for divorce against you. While we do have positional advantage, we'd be throwing it away with a shove. Perhaps if we had 100 big blinds, we might be tempted to. However, with a player that we know little about and have no significant history with, as well as being deep stacked 220 big blinds, a safer option would be to flat call and use our positional advantage post flop.